Corporate Transformation Resources has been intensively involved in some of the business world’s most path breaking transformations during the past two decades. Founded by Robert H. Miles, author of Leading Corporate Transformation and BIG Ideas to BIG Results: Leading Corporate Transformation in a Disruptive World, the firm has established a proven track record of success for supporting executive leaders as they rise to the challenges of leading corporate transformation. ACT also incorporates a streamlined, high-engagement, all-employee cascade methodology, which rapidly creates a clear line of sight between new company-wide initiatives and the job-level objectives of all managers and employees. The ACT process architecture has been designed to quickly focus, align, and engage the full organization and then rigorously follow through for execution. It was also designed to be run by business leaders with light consulting and implementation support the first time through. ACT allows managers at all levels to effectively lead organizational transformation and strategy execution on their own, and it becomes part of a more rigorous management process by the end of the first year of implementation. Harvard Business Review "Acclerating Corporate Transformations"
Corporate Transformation Resources is led by Robert H. Miles, a long-time thought and practice leader in the fields of business transformation, organizational effectiveness, culture change, and executive leadership. Bob Miles has pioneered an Accelerated Corporate Transformation, or ACT methodology that enables new CEOs to rapidly take charge in a high-engagement manner. by Robert H. Miles, Ph.D.
"A must-read for any serious business leader who intends to be competitive in the twenty-first century. Bob Miles is a world-class practitioner and academic who has distilled practical lessons from his firsthand experience in the trenches helping some of the business world's most important transformations." -from Noel M. Tichy, Professor, Michigan Business School and Director of the Global Leadership Program; Author of Control Your Destiny or Someone Else Will and Judgment. Miles articulates a winning framework that has evolved since his early career in developing transformational leaders at the Harvard Business School. Over the past twenty years, Miles's model has been tested and refined in a variety of situations to help companies restore financial viability, integrate merged operations, and pursue quantum revenue growth...The powerful lessons of success detailed in this book can help leaders avoid the costly lessons of trial and error and face today's challenges aimed with crucial insight and experience. National Semiconductor's transformation is legendary in the business community, and its champion, then chairman and CEO Gil Amelio, was catapulted into prominence as a result. At his right hand was Robert Miles. Now leading an ambitious and highly public comeback bid at Apple Computer, Amelio and Miles are charged with pulling the once-invincible computer corporation back from the brink. Corporate Comeback is a riveting day-to-day story of National's incredible transformation that serves as a field-tested map for leaders who need to achieve significant change without exposing their organization to unacceptable risks. Miles articulates a winning framework that has evolved since his early career in developing transformational leaders at t he Harvard Business School. Over the past twenty years, Miles's model has been tested and refined in a variety of situations to help companies restore financial viability, integrate merged operations, and pursue quantum revenue growth. Miles has seen dramatic, successful change on numerous occasions-as a key player on Jack Welch's early corporate transformation team at General Electric, with Amelio at Rockwell, and then at National. The powerful lessons of success detailed in this book can help leaders avoid the costly lessons of trial and error and face today's challenges armed with crucial insight and experience. A widely recognized thought and practice leader in the field of corporate transformation and strategy execution, Bob is a gifted business advisor and process architect. Based on a unique senior executive program he chaired at the Harvard Business School earlier in his career, Bob developed a simple, powerful approach for accelerating the achievement of breakthrough results across a variety of corporate transformation challenges. Once reserved only for executives in residence at Harvard Business School and a select group of global companies, the basic principles for addressing breakthrough performance are now available in his new book BIG Ideas to BIG Results with Dissero Partners colleague Mike Kanazawa, and through his new Speaking Series. "The framework Bob Miles illustrates in his new book has been the key tool Symantec has used to start the shift from being a technology-driven to a customer-driven company. Business leaders facing a variety of corporate transformation challenges will benefit from this important executive briefing." The distillation of a stellar twenty-year career, Leading Corporate Transformation is consultant Robert Miles's reply to executives who want to be able to rise to the most pervasive challenge facing them today: how to achieve fundamental transformation without exposing the organization to unacceptable risk. Here, in the form of an executive briefing, are the expert guidance and tools you need to meet a variety of corporate transformation challenges, whether you are trying to reposition a successful company, revitalize a failing one, merge different businesses and cultures, or manage a leadership succession process. These insights are relevant not only for senior executives, but also for leaders at all levels of an organization undergoing fundamental transformation. If you are a leader-at any organizational level-who must effect fundamental change, you will want to keep this book close at hand. 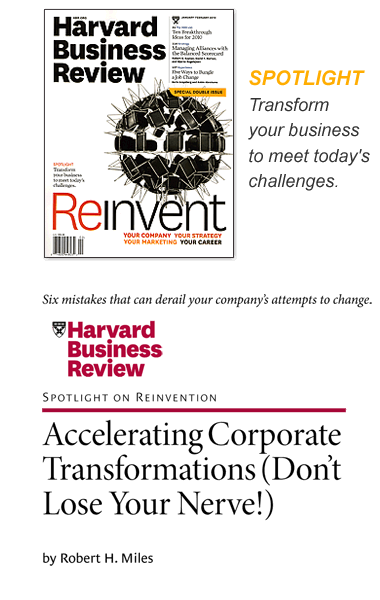 "Accelerating Corporate Transformations (Don't Lose Your Nerve)," by Robert H. Miles, Ph.D. Harvard Business Review January-February 2010, Spotlight on Reinvention issue, pp. 67-75. "Ask any CEO who has overseen a corporate transformation what should have been handled differently, and you are likely to get this answer "We should have—and could have-moved faster." Such executives have a long list of regrets: They wish they had unified the leadership team right away. They wish they had engaged employees sooner and quickly drummed up support for the new vision. They wish they hadn't waited so long to test their assumptions and refine their key initiatives. And they wish they had generated some visible returns early on, to accelerate the commitments and reinforce the expectations of employees, customers, suppliers, and investors." "Beyond the Age of Dilbert: Accelerating Corporate Transformation by Rapidly Engaging All Employees," by Robert H. Miles, Ph.D. Organizational Dynamics , Special Edition, Summer 2001. "As we cross the threshold of a new millennium, a fundamental shift is taking place in the relationship between the organization and the employee in all business sectors. The shift is so huge and the consequences so profound that it is almost as though we are witnessing a time-accelerated shift in two tectonic plates. The plate that is sliding under the new one is submerging an era in which management was the predominant focus in business enterprise. This Era of Management deified a. long line of corporate visionaries, including Lee lacocca of Chrysler Corp., Jack Welch of General Electric Co., Sam Walton of Wal-Mart Stores, and Andy Grove of Intel Corp., to name only a few of the era's highest priests." "Accelerated Organizational Transformation: Balancing Scope and Involvement," by Robert H. Miles, Ph.D.in Breaking the Code of Change. (Boston: Harvard Business School Publications) 2000, pp. 381-406. "The challenge sweeping over almost all industries today is the need to achieve rapid-cycle, organizational transformation. Not rapid-cycle, project-based, incremental change or slow, lumbering, organization-wide transformation...Large, complex organizations do not rapidly change by sequentially pursuing a series of short-cycle projects. The learning cycle involved in such an approach is simply too protracted and the anticipated diffusion of learnings throughout the enterprise too unpredictable to keep up with the increasing pace of change imposed on the organization by the external environment. So how do we speed up the process of corporate transformation and at the same time increase the capacity of leaders/managers at all levels?" "Leading Corporate Transformation: Are You Up to the Task?" by Robert H. Miles, Ph.D.in The Leader's Change Handbook. (San Francisco: Jossey-Bass Publishers, A Division of John Wiley & Company) 1999, pp. 221-267. "To master the new pace, transformation leaders have to get it right the first time. They can't wait for early successes to hatch before the rest of the organization catches on. They have to hit the beaches simultaneously on all fronts. They no longer have the luxury of gradually cascading new ideas and expectations down through the organization. They have to greatly enrich and accelerate the processes of learning within the organization. And they have to quickly engage all employees, obtain their commitment, and enable them to lead at their own levels." Companies today are faced with the need to constantly transform themselves, but too often are trapped in a state of gridlock and task overload that keeps them stuck in a rut. Generating a corporate transformation, a high energy shift in strategic direction, is one of the most difficult challenges a person will face in their career, and one of the most rewarding when you get it right. Put simply, transformation means opening up new possibilities for growth and moving from one state to another, but it is tough work and most efforts fall short. Quickly getting an organization from big ideas to big results is today's top management challenge. Big Ideas to Big Results demystifies what it takes to break through the gridlock and lead accelerated transformations that generate breakthrough results. Through 25 years of refining and streamlining the ACT (Accelerated Corporate Transformation) process based on real work with real leaders, this book shows you how to quickly focus, align, and engage your organization to accelerate transformation and drive breakthrough results. With the process as a guide, the authors found that the way in which leaders apply the process really makes the difference, and share how to do that with the readers. There's no silver bullet: it's a simple process and tough work to lead it correctly. Michael Lee Stallard (mstallard@epluribuspartners.com), author of Fired Up or Burned Out, 03/12/2008 Leaders of organizations would be wise to follow the advice of Michael Kanazawa and Robert Miles in their excellent new book entitled Big Ideas to Big Results. The book lays out their ACT process for organizations that want to implement three to four major initiatives each year. The authors developed the process to combat corporate ADD and employee disengagement when it comes to executing organizational initiatives. Based on my more than 25 years experience in business as well as my expertise in employee engagement, I completely agree that these are major problems in organizations today and the solution the authors propose will go a long way toward solving them. The ACT process is also entirely consistent with the employee engagement research we have conducted at E Pluribus Partners and presented in Fired Up or Burned Out: How to Reignite Your Team's Passion, Creativity, and Productivity. Kanazawa and Mile's ACT process works in part because it helps meet universal human needs for respect, recognition, belonging, autonomy, personal growth and meaning. When these needs are met, people thrive, individually and collectively. Strong leaders will recognize many of the best practice steps that are a part of ACT. What makes this book valuable is the way the authors integrate the best practices into a step-by-step process and add ideas of their own. I especially liked their descriptions of annual high employee engagement cascades with tablework and quarterly mini-cascades. It's worth buying the book just to learn more about these practices alone. Big Ideas to Big Results will be popular with corporate leaders. It's a quick and easy read with a process that is practical to implement and will help move organizations from identifying big ideas to producing big results. Congratulations to Kanazawa and Miles for developing an important new contribution to process innovation and describing it in an accessible way. Copyright © 2008 by Michael T. Kanazawa and Robert H. Miles. All rights reserved. —John W. Spiegel, Chairman, S1 Corporation, and Former Vice Chairman and Chief Financial Officer, SunTrust Banks, Inc.
—Peter L. Lynch, Chairman, CEO, and President, Winn-Dixie Stores, Inc.
—Dr. Bami Bastani, President and CEO, Anadigics, Inc.
—Anthony Charaf, Senior Vice President, TechOps, Delta Air Lines, Inc.
—John Baker, CEO and President, Florida Rock Industries, Inc.
—Tony Weiss, Vice President/General Manager, Software, Peripherals, Imaging, Displays, and Dell Direct Retail, Dell, Inc.
Why do most corporate transformation leaders fail to achieve breakthrough performance? They make things too complex. They clutter it with jargon and confusion. They pancake new initiatives on top of old ones. They dither on the launch pad. They chase too many fads. And they fail to make it "safe" for leaders to lead the transformation at their own level. In short, they don't have a reliable corporate transformation game plan. A PROVEN NO-NONSENSE, STEP-BY-STEP, RESULTS-DRIVEN APPROACH TO DRIVING CORPORATE TRANSFORMATION AND BREAKTHROUGH PERFORMANCE IN A DISRUPTIVE WORLD. DrawIng on over 30 years refIning and applying ACT, initially with new CEOs and their teams at Harvard Busmess School and then by supporting leaders of corporate transformationa across a variety of industries. Miles and Kanazawa layout a simple and compressed roadmap for stepping an organization and all of its employees through a sequence of phases that ensure transformation success. ACT strips away complexity and indecision, helping you move far more rapidly and predictably from confronting reality and strategy development through execution to breakthrough results, at any level, in any function, in any organization. Whether you’re executing a new initiative, restoring your company’s growth, entering a new market, or attempting to transform your enterprise, this book will help you find the right path, clear the obstacles, and get to breakthrough performance – safely and quickly. "A great corporate transformation game plan for leading in a disruptive world. This very practical playbook is simple, fast, inclusive, results-oriented, and proven." ENABLING NEW CEOS ANO EXECUTIVE LEADERS TO "TAKE CHARGE" IN A RAPID HIGH ENGAGEMENT MANNER TO LAUNCH THE NEXT MAJOR PHASE OF THEIR ENTERPRISE. EQUIPPING SITIING CEOS AND EXECUTIVE LEADERS TO SUCCESSFULLY TRANSFORM THEIR COMPANY'S COURSE AND ACCELERATE GROWTH. Why do most executive leaders fail to achieve breakthrough performance? They make things too complex. They clutter the company with jargon. They dither on the launch pad. They hire too many consultants, chase too many fads. A NO-NONSENSE, STEP-BY-STEP, RESULTS-DRIVEN APPROACH TO DRIVING BUSINESS TRANSFORMATION AND BREAKTHROUGH PERFORMANCE. Drawing on the foundations laid in the highly innovative program Miles chaired at the Harvard Business School, and continuing with his experience in working with Kanazawa and with hundreds of senior executives, the authors show how to align your organization behind just a few core initiatives, bias your organization your organization toward speed, create leaders at every level, and achieve traction and accountability in all facets of execution. You’ll learn how to engage people instead of frustrating them, and harness their energy instead of wasting it. Fewer than half of employees, according to a quoted poll understand their company's strategic goals and only 43% think there is ever any follow-through on planned strategy shifts. This is why the authors assert, so many corporate initiatives fail. After seeing the process break down countless times, Kanazawa and Miles developed a step-by-step guide to harnessing the energy that companies usually waste when introducing initiatives. By creating more of a "'buy-in' throughout the organization through accountability, employees become committed to company goals, they claim. Their clear and hands-on approach is useful for anyone whose livelihood is tied to the successful execution of business initiatives." 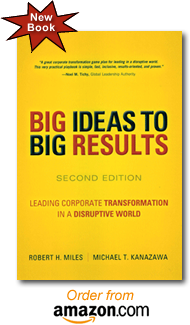 "An Innovative Organizational Process that Produces Result Every Year"
"Leaders of organizations would be wise to follow the advice of Michael Kanazawa and Robert Miles in their excellent new book entitled BIG Ideas to BIG Results. The book lays out their ACT process for organizations that want to implement three to four initiatives each year...Kanazawa and Miles' s ACT process works in part because it helps meet universal human needs for respect, recognition, belonging, autonomy, and personal growth and meaning. When these needs are met, people thrive, individually and collectively. Strong leaders will recognize many of the best practice steps that are part of ACT. What makes this book valuable is the way the authors integrate the best practices into a step by-by-step process and add ideas of their own. I especially liked their descriptions of annual high engagement cascades with tablework and quarterly mini-cascades. Its worth buying the book just to learn more about these practices alone. BIG Ideas to BIG Results will be popular with corporate leaders. It's a quick and easy read with a process that is practical to implement and will help move organizations from identifying big ideas to producing big results. Congratulations to Kanazawa and Miles for developing an important new contribution to process innovation and describing it in an accessible way."